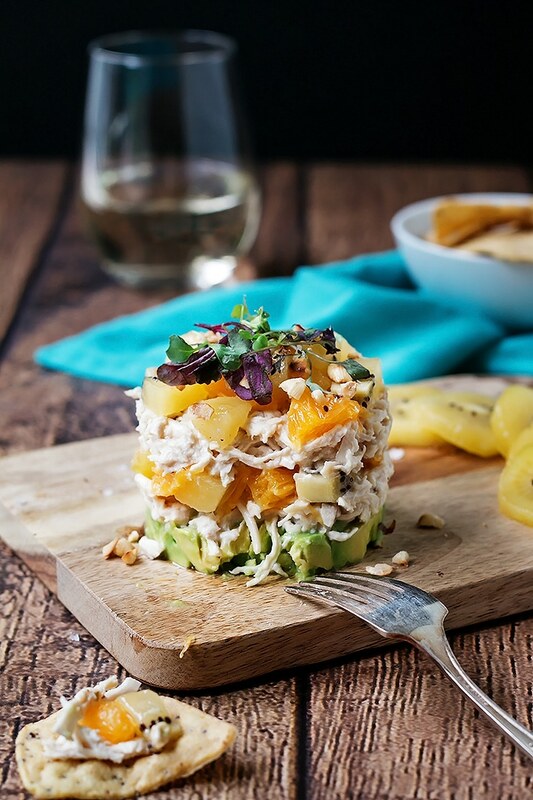 Kiwi and avocado chicken salad, sponsored by Zespri SunGold Kiwi, is stacked with layers of flavor from the creamy avocado to the garlicy shredded chicken and sweet nuggets of SunGold kiwi and orange. 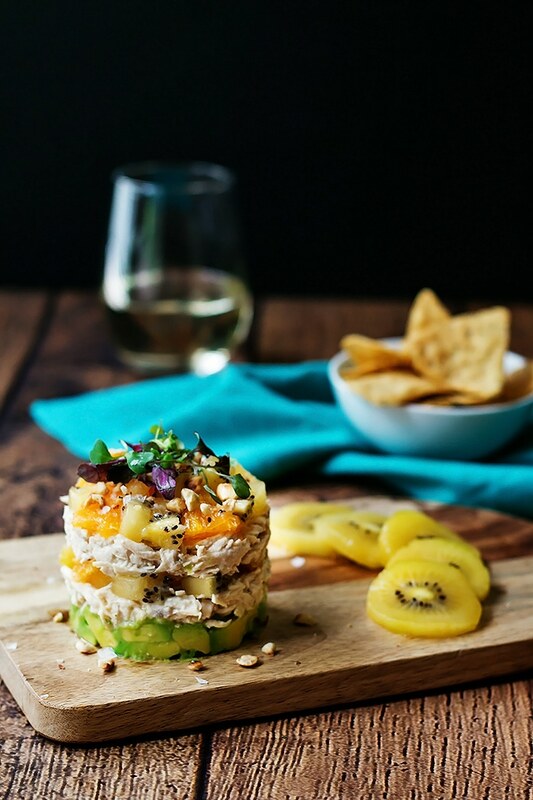 We originally planned to make this kiwi and avocado chicken salad by mixing it all together and serving it like you would expect a chicken salad to be served, but Debbie had the great idea to class it up a bit and serve it as stacked layers. The result is a gorgeous presentation that could easily be served at a fancy dinner party or at any lunch or dinner where you want to impress. Its not only beautiful, its totally delish! The layers start with diced avocado that have been tossed in lime juice and a little salt. Then there are alternating layers of shredded chicken and fruit. The shredded chicken is made by poaching chicken breast in stock flavored with onion and garlic and simmered until it falls apart easily. Then its mixed with a little mayo, fresh grated garlic, lemon juice and salt and pepper. 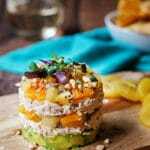 Its creamy, garlicy and the perfect compliment to the fruit layers which are simply diced SunGold kiwi and navel orange segments. We top off the stack with micro greens for a little color and crushed hazelnuts for a tiny little crunch. One of the first things we noticed when we cut one of these Zespri SunGold kiwi’s in half is that it was more yellowish in color, rather than the green color we were used to. We used a spoon and slid it in between the kiwi flesh and the skin, ran the spoon around the kiwi, gave it a little squeeze, and the skin just slid right off! Did you know the easiest way to peel a kiwi is with a spoon? SO easy! Anyways, the next difference we noticed about the SunGold Kiwi is the taste. We couldn’t believe how sweet it was, but still with that telltale kiwi flavor that I can only describe as a bit tangy. Love! If you haven’t tried a SunGold Kiwi, you really need to give one a try. You can get them at your local grocery store from May all the way until October. Not only do they taste great, they also have a ton of vitamin C and have as much potassium as a banana. And for all you ladies out there with a little bun in the oven, Kiwi fruit are one of the few natural sources of folic acid. Kiwis are also really great for people looking to add more soluble and insoluble fiber to your diet because they have both, which is rare for fruit. Have I also mentioned that these SunGold Kiwis are delicious! Both plain and in recipes like our fancied up kiwi and avocado chicken salad. 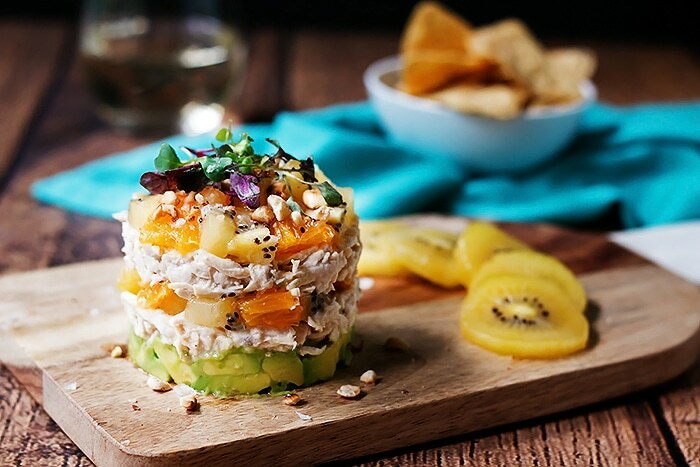 There are a number of ways to serve this kiwi and avocado chicken salad. Serve it as a stack with chips or eat it as is with a fork for a more upscale presentation as we have shown here. Or gently mix the chicken together with the fruit and stuff avocado halves with it. That would be delicious and a more casual way to serve this. Finally, you could dice the avocado and mix it together with chicken and kiwi and make sandwiches out of it or lettuce wraps, or just dollop it on top of a green salad and have at er. 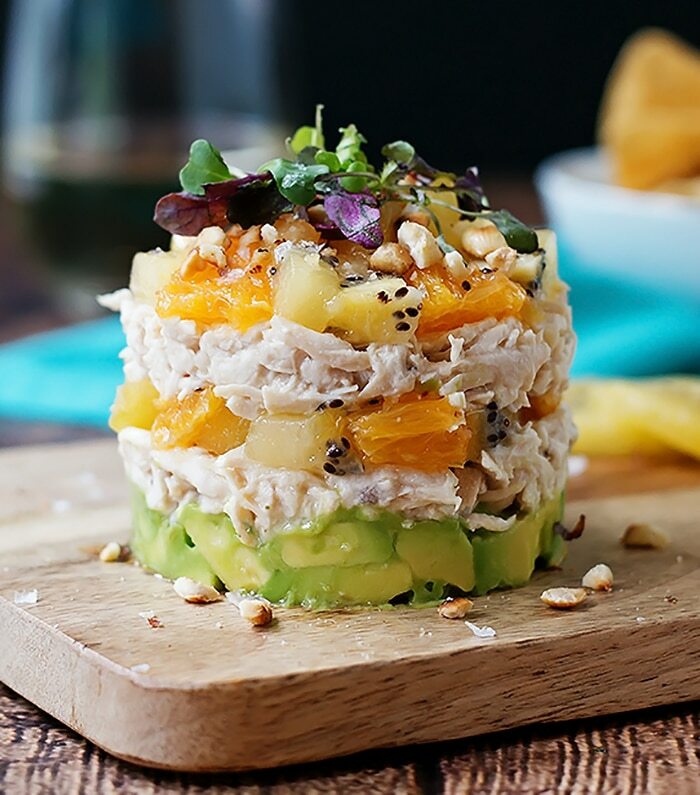 Any way you choose to serve this kiwi and avocado chicken salad, its gonna be good! 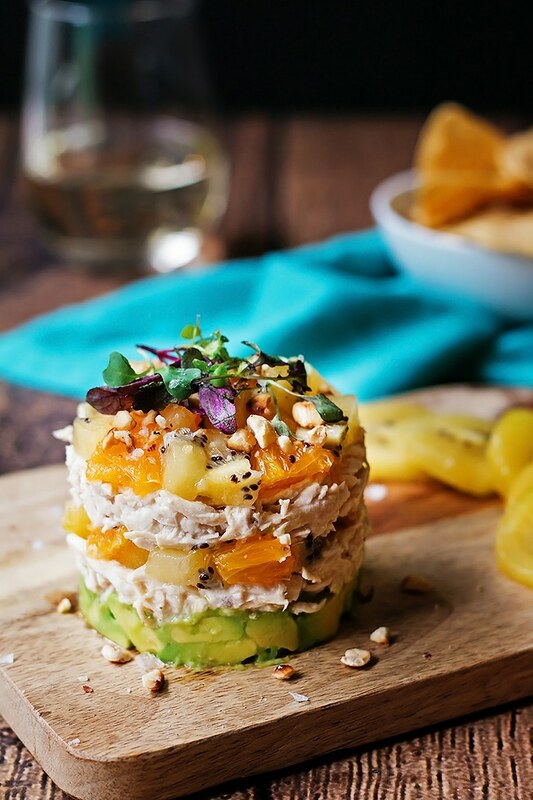 This kiwi and avocado chicken salad is stacked with flavor from the creamy avocado to the garlicy shredded chicken and sweet SunGold kiwi and orange pieces. First make the chicken. Add the chicken, chicken stock, onion and garlic to a medium pot. Bring to a simmer and let it simmer for an hour or until the chicken starts falling apart easily. When its ready, strain and let it cool till you can touch it and pull it apart with your hands. Set aside. Make the aoili. Add the mayo, garlic, lemon juice, salt, pepper and olive oil to a medium bowl. Stir to combine. Add in the shredded chicken and stir again. Season to taste with more salt and pepper. Get the avocado ready. Prepare the avocado by slicing in half, removing the pit, and then slice through the flesh just until you hit the skin first length wise and then width so that you have a bunch of little pieces sitting on the skin. Then take a spoon and scoop out the flesh into a bowl. Repeat with the other side. Cut up the orange. Peel a naval orange and remove the segments with a knife. That way you dont get the membrane of the segments as well. Just the juicy bits. Cut up the kiwi. Slice each kiwi in half. Take a spoon and slide it between the skin and the flesh. Run the spoon around the kiwi and under it. Pull the skin off. Dice up the kiwi flesh. Repeat with the rest of the kiwi halves. Put the salad together. Get out a ring that will allow you to stack the salad inside. Place the ring on your serving plate. Start with the avocado on the bottom of the ring. Press the avocado down gently so it makes an even layer. You don't want to squish it too much. Next add 1/4 cup of the chicken mixture and push it down gently as well. Follow with 1/4 cup of the kiwi and oranges mixture. Repeat the chicken and fruit layers. Garnish with micro greens and crushed hazelnuts. This is so beautiful and it sounds so delicious! I haven’t tried Sungold Kiwis yet but I’m definitely going to keep and eye for them at the grocery store! I love the stacked layers, they look delicious. All those flavors would be perfect. Once I can get kiwis I’m going to try making this. Thanks for sharing.